This script provides finer control over regions and encounters. As a review, an encounter can have up to three regions, including no region. When no region is specified, the encounter can show up anywhere. 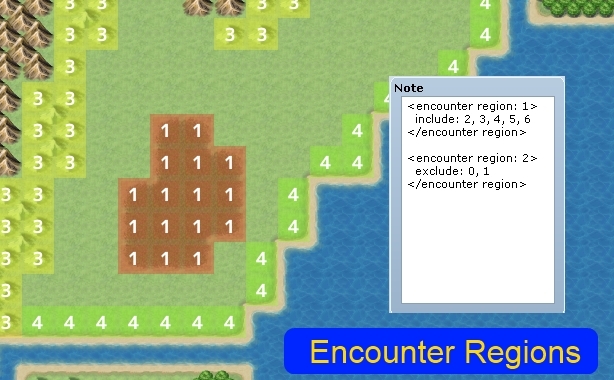 When a region is specified, the encounter will only show up on tiles that have the same region. Specifying more regions for each encounter. So if you want an encounter to appear in more than 3 regions, that is possible without creating duplicate encounters. These are called “include” regions. Specifying “exclude” regions. If the encounter should be excluded from region 1,2 and 3, then it will not appear in any of those regions. Where ID is the encounter ID that you want to apply this note to. You can determine the ID of an encounter by counting its position on the list. The first encounter has ID 1, the second encounter has ID 2, and so on. There is a special region called the “zero region”. This is the default region for every tile: if you don’t specify a region, it is the zero region. Zero Region has an ID of 0. This might be useful if you want encounters to occur only in certain regions, but you didn’t want to specify every encounter. To do this, you would just exclude the zero region. This note-tag format allows you to specify an unlimited number of include and exclude regions as long as you separate them by a comma. For the include regions, they will be added to the encounter’s existing include regions, if they are set.